Sen. Patrick Leahy didn't hold back while questioning Attorney General Jeff Sessions on Wednesday. Sen. Patrick Leahy didn't hold back while questioning Attorney General Jeff Sessions on Wednesday about a potentially false statement Sessions made during his January confirmation hearing. "I've never accused you of colluding with the Russians, but you clearly — in your answer of no, you clearly concealed your own contact with Russian officials at a time when such contact was of great interest to the committee," Leahy said during the Senate Judiciary Committee hearing. At the time, Sessions didn't reveal he'd met with Russian Ambassador Sergey Kislyak multiple times in 2016. But the press later uncovered at least three meetings between the two. Sessions, however, doesn't believe he gave false testimony and brought a hard copy of the original question to prove his point. He said: "The question you're referring to is subparagraph E, and it says, 'Several of president-elect's nominees or senior advisers have Russian ties. Have you been in contact with anyone connected to any part of the Russian government about the 2016 election either before or after Election Day?' And I took that to mean not any casual conversation, but did I participate with Russians about the 2016 election. ... Every one of your previous questions talk about improper involvement, and I felt the answer was 'no.'" So Leahy decided to ask Sessions the same question about his interactions with any Russian officials. And this time, Leahy got very specific. "Since the 2016 campaign, have you discussed with any Russian-connected official anything about emails?" Leahy asked. "Discuss with them? I don't recall having done any such thing," Sessions said. "Have you discussed with them Russian interference in our elections?" Leahy asked. "Have you discussed anything like sanctions like the Magnitsky Act — what they call the 'adoption issue'?" Leahy asked. "I don't believe I've ever had any discussion at any time about the Magnitsky Act," Sessions said. 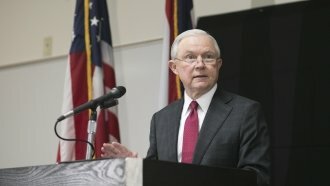 However, Sessions did say it was "possible" he discussed now-President Donald Trump's political positions when he talked with Kislyak in 2016.